Earlier this year, I went up to visit Sparkenhoe Farm and they were kind enough to let me watch their cheese-making (they were also kind enough not to laugh too much when I was too puny to drag the cheese harp through the curds). When I arrived, the starter cultures, rennet and annatto had already been added to the milk and it was just starting the process of solidification. Starter cultures contain ‘friendly’ bacteria which, when added to the warmed milk, ferment the sugar in the milk – the lactose – into lactic acid, at which point the milk turns sour, starts to thicken and is ready to take the rennet. Rennet contains enzymes which cause milk proteins called casein to join together in networks that trap water, fat and calcium – these are the precious curds. 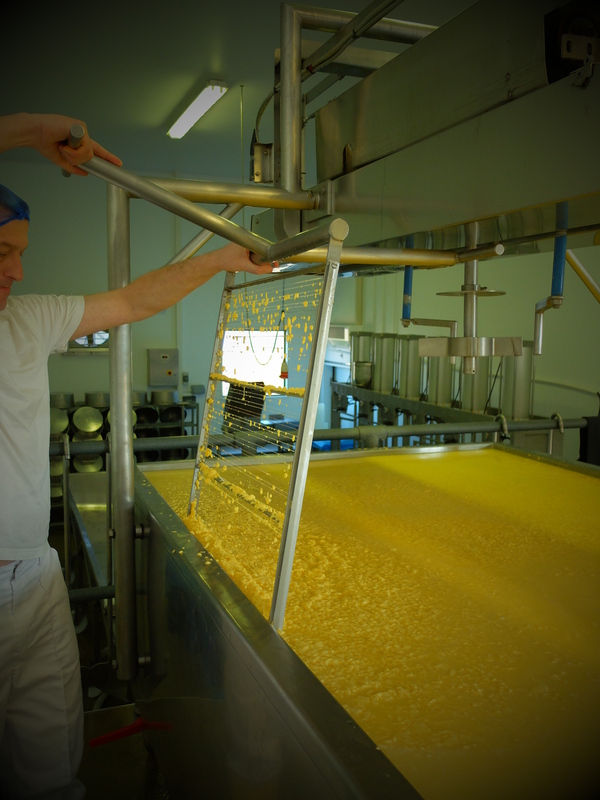 When the curds had set to a wobbly, blancmange-like consistency, the cheese-makers, Craig and Steve, passed a cheese harp down into the curds – it’s called a harp because that’s what it resembles, a frame with parallel wires that cut through the clouds of curd. As they started to cut at right angles the lumps of curd began to emerge. 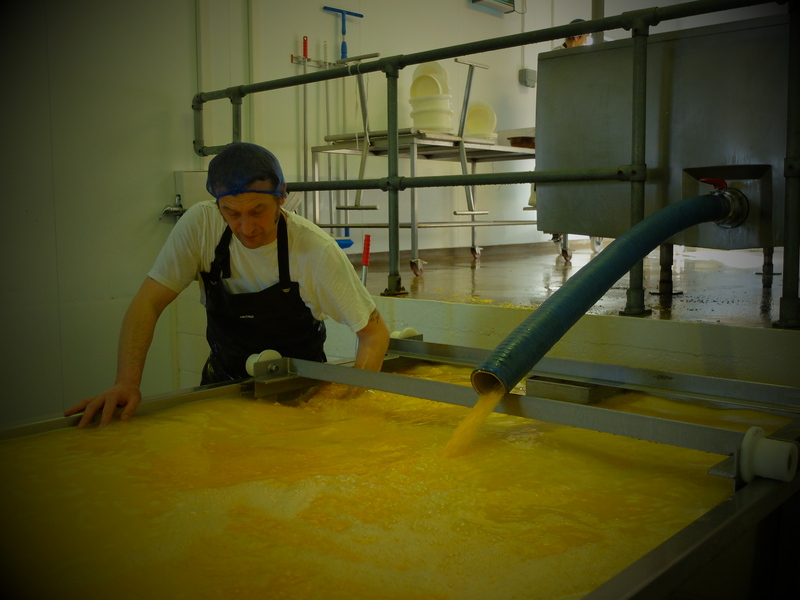 This process releases more whey, so that at first the curds floated wet and buttery under the surface but then they started to firm up and cling to the harp like scrambled egg. The next part of the process was to scald the curds, gently heating them so that the particles contracted and released more whey. This is an essential step in producing hard, dry cheeses – in contrast to crumblier, more open cheeses that are scalded only partially or not at all. When the curd chunks were the correct consistency and acidity, the mixture was released through a pipe in a sunshine-yellow spume that gushed into a vat below. 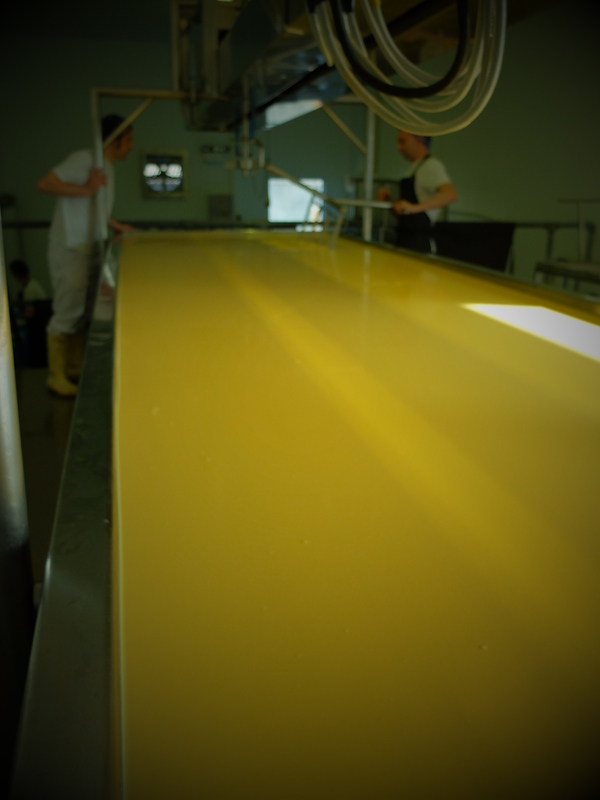 The lower vat was full to the top with roiling yellow liquid but soon the whey drained away, leaving the curds behind. The warmth and lack of whey meant that the curds began to cosy up to each other and knit together. 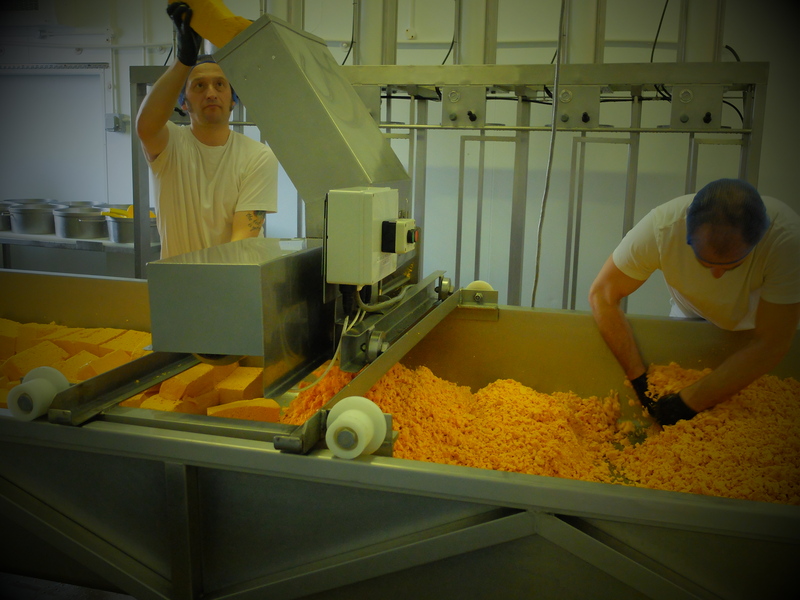 Most people know ‘Cheddar’ as one of two nouns: a hard yellowish cheese or a village in Somerset famous for its rocks and caves but it’s also a verb, the name of a process used in the production of Cheddar cheese, as well as other hard cheeses such as Red Leicester and Derby. 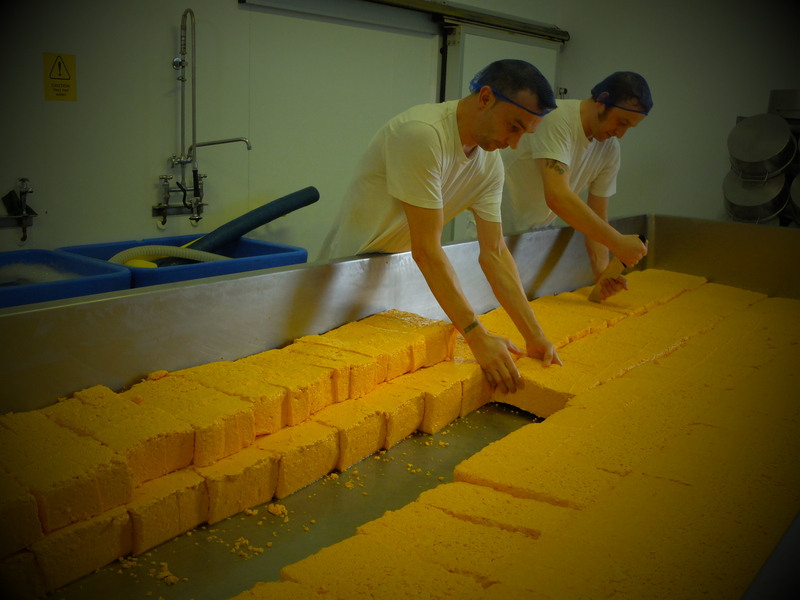 When the curds had matted together, they were cut into cheese breeze blocks and stacked one on top of another. Every fifteen minutes they were flipped again so that each block took its turn on the top and bottom of the stack. This helped to expel more whey from the curds and also allowed the acidity to rise – making for a firmer cheese with a distinctive tang. The texture changed from popcorn-coated floppy bricks into longer, smoother forms that resembled the fibres of cooked chicken breast when you tore them apart. 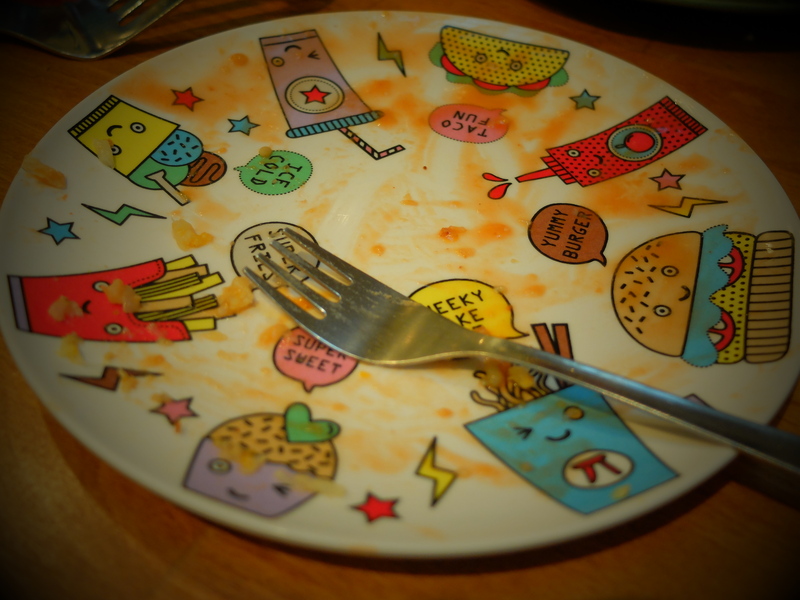 Having watched the milk change from liquid to gel to bits of solid to discernible cheese-shaped rhomboids, the next stage was almost a shock. The vat was all action, as Craig posted each slab of nearly-cheese into the chute of a metal contraption and it fell back into the vat, chopped into tiny chips. This was milling and enabled the curds to be evenly salted. David took charge of the salting with a bucket, a pair of rubber gloves and a pitchfork. Following the mill, he seized great armfuls of the curd pieces, tossing and throwing them in the vat to ensure that the salt from the bucket was evenly distributed. Cheese regularly comes under fire for its salt content but, as well as expelling more whey from the curds and contributing to flavour and texture, salt is vital for making a safe and long-keeping cheese. Adding the optimum amount of salt inhibits the bacteria introduced in the starter cultures which, if left unchecked, would start to run riot and spoil the cheese. 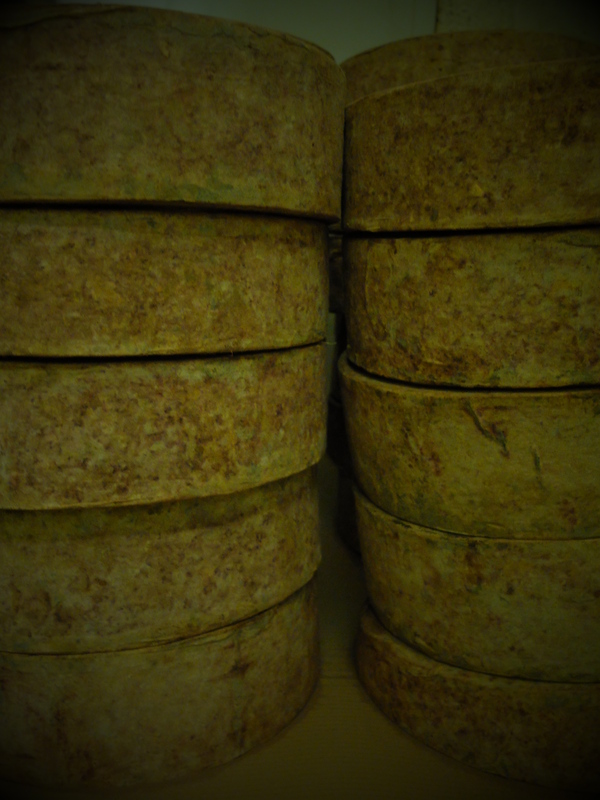 It also prevents ‘bad’ bacteria from turning the cheese putrid after they’re pressed and sent to the maturing rooms. The curds were packed into moulds and pressed for 24 hours before being turned and pressed for a further 24 hours, and the resulting cheeses were covered in cloth and lard and sent to the maturing room. A modern room with high, barn-like ceilings and concrete floor, it was cool and quiet. Shelves of beechwood filled the room, with wheel after wheel of Sparkenhoe stacked right up to the roof. The smell was musty, slightly earthy, with a sweeter edge, like the inside of an old writing desk. Some of the cheeses were still determinedly orange, with just a salt and pepper beard of mould mottling through the lard and cloth. Others were completely mummified with a coating of what looked to be grey until I peered up close and saw lichen-like patches of green and flashes of red. 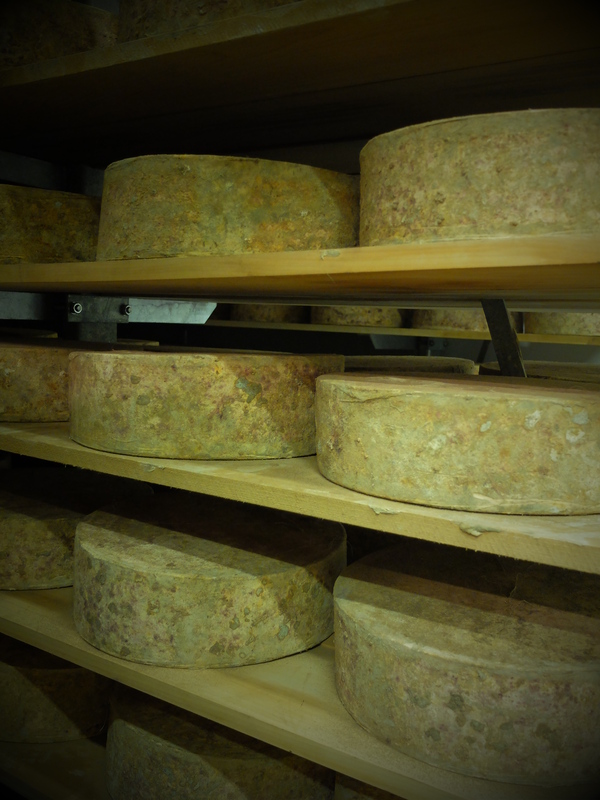 The cheeses stay in the store for a minimum of four and a half months but as long as nine and must be regularly cosseted: for their first week, they’re turned every day, then every week for a month and then once a month thereafter. I’m forever looking for ways to force my children to eat vegetables and was sure they’d be unable to resist anything coated in Sparkenhoe. Sure enough, the eldest was a fan as soon as he tasted it in the shop and pestered me continuously for ‘some of the orange cheese’ for the rest of the day. But would it be enough to persuade them to eat the dreaded cauliflower? Preheat the oven to 200˚C/180˚C fan-assisted/Gas Mark 6. Mash the steamed cauliflower and cooked potato and add nutmeg and salt and pepper to taste. 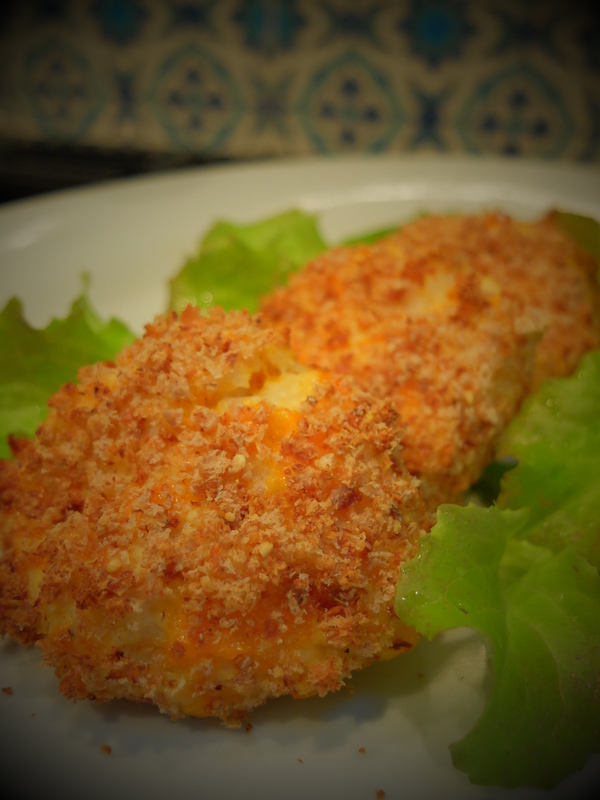 Add the egg and grated cheeses and mix thoroughly.The mixture will be wet but okay to handle. 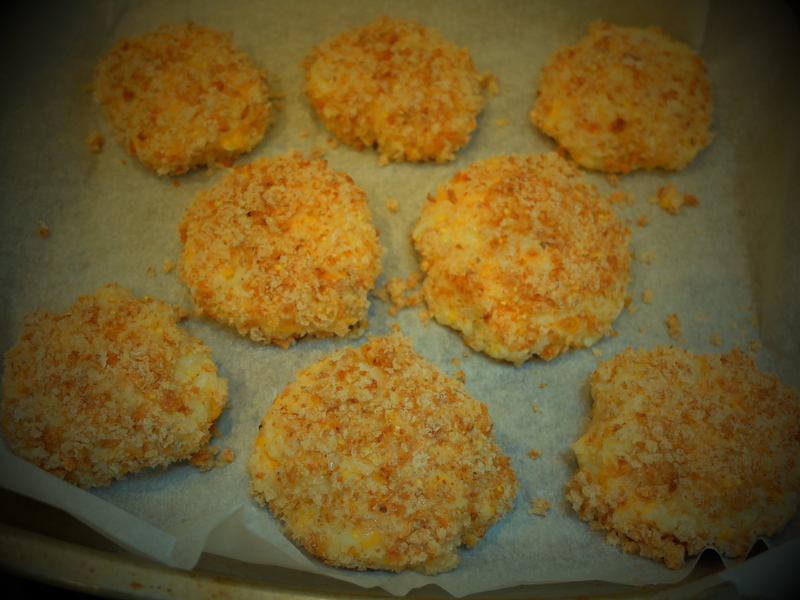 Make little golf-ball sized patties and roll them in the breadcrumbs (I rolled them in egg first but it was fiddly as they were quite wet anyway – plus my food critic child complained they tasted ‘too eggy’). Put them on a baking tray lined with parchment and cook for about twenty minutes in the oven. Bravo, Sparkenhoe! And many thanks to the Clarkes and their team for letting me lurk about for the day. After all that talk of harps and clouds I read one sentence as “cutting at right angels” but eventually my brain caught up with my eyeballs. Sounds like a great cheese, will look out for it. And love the sound of the fritters. Haute cuisine they ain’t but rather tasty. I felt a bit like I was wasting good cheese but fortunately bought a large enough black to have some to nibble too.